World History for Us All has a double research base: the most recent scholarship in world history and the cognitive issues of how children learn history. This essay reviews briefly the scholarly field of world history and its application to teaching. A bibliography for further reading is also included. In the past century and a half, historians have adopted exacting standards of research and inquiry. The laying down of professional rules for gathering, analyzing, and interpreting evidence has benefited world history as a modern field of scholarship. This commitment to rules of evidence separates the “new world history” from the older tradition of “universal history” associated, for example, with Arnold Toynbee. Universal history closely joined the study of the human past to religion and philosophy, specifically the search for general historical laws or patterns that might reveal the total meaning and direction of the human venture, past and future. Heavily burdened with what we now see as questionable theories of knowledge, universal history no longer has many advocates. William H. McNeill made a key contribution in 1963, when he published The Rise of the West: A History of the Human Community. McNeill was influenced by Toynbee, but his sweeping narrative rested on solid professional methods. The scope of historical research has expanded over the past century from political, diplomatic, intellectual, and institutional history to embrace many new approaches. These include social, cultural, gender, and environmental history. This broadening of the historical discipline is a reflection of the entry of many more women, minorities, and people of working-class background into the academic professions. It also reflects new trends in society, notably the increasing immigration into the United States of people from Latin America, Asia, and Africa. These trends have reshaped the ways in which we see and understand the past. They have led the historical profession to accept the idea that the whole world and all its peoples, not just Europeans, Americans, and male governing groups, should be open to historical inquiry. Sweeping changes in the discipline of history have also included an expansion of the range of appropriate scales of research—scales of both time and space. Until quite recently, nations have been the primary frame in which most histories were written. But the end of colonialism and awareness of the growing economic and cultural interconnectedness of peoples have set off a kind of intellectual Copernican revolution in the way we think about the world. That is, historians have begun to imagine geographical frames beyond the nation-state and the civilization. Specifically, they have been exploring the modern and pre-modern histories of Africa, Asia, Native America, and Oceania, which were previously neglected. Efforts to “re-vision” the world as a space in which humans interact and intercommunicate have led us toward the necessity of devising larger geographical frames—what we call in the History, Geography, and Time section of this curriculum “Big Geography.” This is the idea that the world as a spherical whole, and not just particular land masses or regions, has a geographical personality with which students should be familiar. The setting of world history is ultimately the earth and not just parts of it viewed one after another. The dismantling in the 1960s and 1970s of the European, American, and Japanese colonial empires, together with the inescapable fact of globalization, have led to an expansion in the temporal scale in which history is written. In place of older historical narratives that placed Europe at the center, and viewed it as the motor of world history, scholars have begun to rethink Europe’s “moment” of political dominance. A world historical perspective can enrich our understanding of how we humans have been mixed up in one another’s lives for a very long time, and it points to the fundamental unity of humankind. More generally, trends in the natural sciences have dramatically reinforced the expansion of time scales. As cosmology, geology, evolutionary biology, evolutionary psychology, and genetics have concerned themselves more and more with explaining past developments, it has become possible to link human history to the history of the universe as a whole. This perspective is embedded in David Christian’s book, Maps of Time: An Introduction to Big History (Berkeley: University of California Press, 2004). Christian calls this perspective “Big History.” He argues that only the history of the universe can provide the appropriate frame within which to understand the human past. A Big History perspective can help us to think outside of the usual chronological box in which humankind’s story has been told. For example, it prompts a reevaluation of the Paleolithic period (what used to be called the “stone age”). From a Big History perspective the fact that 95 per cent of human history occurred prior to the rise of civilization prompts the questions: why did humans start to plant crops, domesticate animals, and build cities when they got along fine without these things for hundreds of thousands of years? Why did an industrial revolution occur less than 300 years ago? Why did world population start to rocket upward at about the same time? World history for Us All draws upon research in comparative, cross-cultural, and world-scale history since the 1960s. World historians have had an important role in encouraging teachers and students to examine important topics from a wider angle. The study of trade in the pre-1500 world, for example, has opened a window into the ways in which the societies of Afroeurasia were linked together via the silk road, the spice trade of the Indian Ocean, and the trans-Saharan gold routes. Many books have been written in recent decades to provide teachers and students with ways of tracing the links between cultures and civilizations across Eurasia. These include Jerry Bentley’s Old World Encounters; Philip D. Curtin’s, Cross-Cultural Trade in World History; and Ross E. Dunn’s The Adventures of Ibn Battuta. For the trans-Saharan trade, The Golden Trade of the Moors, an older work by E. W. Bovill, is still a reliable overview. Here are three subject areas where a world history perspective has mattered. Slavery and Its Abolition. A generation ago, most historians in the US studied slavery in a US context. Little was known in this country about the history of slavery elsewhere in the Americas, let alone the history of slavery in Africa and the rest of the world. Because of the scholarship of the last thirty years or so, we know a great deal more about slavery and slave trade in Africa than we did a few decades ago. Paul Lovejoy’s Transformations in Slavery is an important survey of slavery in Africa, while Patrick Manning’s Slavery in African Life and John Thornton’s Africa and Africans in the Making of the Atlantic World provide large scale syntheses. 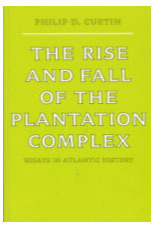 Philip Curtin’s The Rise and Fall of the Plantation Complex is a reliable overview of this important topic in Atlantic and world history. For slavery in the Americas, an essential entry point into what is now a vast literature is Robin Blackburn’s two volume survey: The Making of new World Slavery and The Overthrow of Colonial Slavery. These studies help us understand what a huge impact anti-slavery movements and ideas had on the politics of the nineteenth century world. Dale Tomich, Through the Prism of Slavery, which examines nineteenth century French and Spanish Caribbean slavery, is a thought-provoking recent addition. The study of the post-Civil War Reconstruction period has become an important area for comparative work. Eric Foner’s Nothing But Freedom is a widely used overview that examines the U.S. experience in the wider context of the abolition of slavery in Haiti and Jamaica. Other studies that follow this comparative approach include Thomas Holt’s The Meaning of Freedom and a collaborative work by Holt, Frederick Cooper and Rebecca J. Scott titled Beyond Slavery. It looks at Cuba, East Africa, and Louisiana. History of the World Economy. A second major focus of world history research has been the history of the world economy. For a long time, historians were impressed with the centrality of Europe in the emergence of the modern world. One statement of this approach is Eric L. Jones, The European Miracle, 2nd edition. More global, but still shaped in important ways by a Eurocentric perspective, is Immanuel Wallerstein’s enormously influential three volume work The Modern World System. Research on the Indian ocean economy prior to the sixteenth century by scholars such as K.N. Chaudhuri gradually encouraged historians to move away from the Eurocentrism implicit in Wallerstein’s synthesis. An accessible critique and reinterpretation of this viewpoint is Janet Abu-Lughod, Before European Hegemony. More recently still, historians have re-examined the role of the Chinese economy in the pre-1750 world perspective. Works such as Dennis O. Flynn and Arturo Giraldez’s Global Connections and Monetary History, 1470-1800 have made historians more conscious of the crucial role of silver trade in the fashioning of the world economy after 1492. 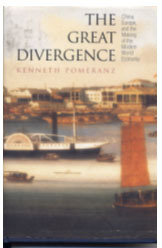 Particularly recommended is Kenneth Pomeranz, The Great Divergence: China, Europe, and the Making of the Modern World Economy. This book is an imaginative effort to rethink the origins of the world economy from the point of view of China. Finally, Robert F. Marks’ Origins of the Modern World Economy is a brief and widely used survey that emphasizes the deep history as well as the environmental context of economic globalization. World Environmental History. A third topic where we can readily see the advantages of a global perspective is the history of human interactions with the biosphere. Environmental history is concerned with population growth, climatic change, infectious disease, natural disasters, and the impact of changing technologies. In World History for Us All we draw on recent scholarship in environmental history, especially works with a global perspective. These include Alfred Crosby’s two books, The Colombian Exchange and Ecological Imperialism, both of which are concerned with the diffusion of plants, animals, and microorganisms across the hemispheres and the consequences for humankind. John F. Richards’ The Unending Frontier is a bold attempt to chart the transformations of the world’s environment in the early modern period. Edmund Burke and Kenneth Pomeranz’s The Environment and World History, 1750-2000 (forthcoming) contains an up-to-date summary of recent research. Brian Fagan has written extensively on large-scale environmental change, including The Long Summer: How Climate Changed Civilization. John R. McNeill has contributed an eye-opening history of contemporary environmental change in Something New under the Sun: An Environmental History of the Twentieth-Century World. These are but three topics where the impact of a world history perspective can be seen. As you explore World History for Us All, you will readily identify dozens of others. World history is an exciting teaching field shaped by research at the cutting edge. Abu-Lughod, Janet. Before European Hegemony: The World System A. D. 1250-1350. Oxford: Oxford UP, 1989. Bentley, Jerry. Old World Encounters: Cross-cultural Contacts and Exchanges in Pre-Modern Times. Oxford: Oxford UP, 1993. Blackburn, Robin. The Making of New World Slavery. London: Verso, 1997. ---. The Overthrow of Colonial Slavery. London: Verso, 1998. Bovill, E. W. The Golden Trade of the Moors. Princeton: Markus Weiner Publishers, 1999. Burke, Edmund, and Kenneth Pomeranz, The Environment and World History, 1750-2000 (Berkeley: University of California Press, 2006). ---. This Fleeting World: A Short History of Humanity. Great Barrington, MA: Berkshire Publishing, 2008. Crosby, Alfred W. The Colombian Exchange: Biological and Cultural Consequences of 1492. Westport: Praeger, 2003. ---. Ecological Imperialism: the Biological Expansion of Europe, 900-1900. Cambridge: Cambridge UP, 1986. ---. The Rise and Fall of the Plantation Complex. 2nd ed. Cambridge: Cambridge UP, 1998. Diamond, Jared. Guns, Germs, and Steel. New York: Norton, 1997. Dunn, Ross E. The New World History: A Teacher’s Companion. Boston: Bedford St. Martin’s, 2000. Flynn, Dennis O., Arturo Giráldez, and Richard von Glahn. eds. Global connections and monetary history, 1470-1800. Aldershot, England: Ashgate, 2003. Foner, Eric. Nothing But Freedom. Baton Rouge: Louisiana State UP, 1983. Goldstone, Jack A. "Efflorescences and Economic Growth in World History: Rethinking the "Rise of the West" and the Industrial Revolution." Journal of World History 13 (Fall 2002): 323-389. Holt, Thomas C. The Meaning of Freedom: Race, Labor and Politics in Jamaica. Baltimore: Johns Hopkins UP, 1992. Holt, Thomas C., Frederick Cooper, and Rebecca J. Scott, Beyond Slavery. Chapel Hill: University of North Carolina Press, 2000. Jones, Eric. The European Miracle, 2nd ed. Cambridge: Cambridge UP, 1987. Lovejoy, Paul. Transformations in Slavery: A History of Slavery in Africa. Cambridge: Cambridge UP, 1983. Manning, Patrick. Slavery and African Life. Cambridge: Cambridge UP, 1990. ---. Navigating World History: Historians Create a Global Past. New York: Palgrave Macmillan, 2003. Marks, Robert B. The Origins of the Modern World: A Global and Ecological Narrative from the Fifteenth to the Twenty-first Century. 2nd ed. Lanham, MD: Rowman & Littlefield, 2007. McNeill, William H. The Rise of the West: A History of the Human Community. Chicago: University of Chicago Press, 1963. Pomeranz, Kenneth. The Great Divergence: China, Europe and the Making of the Modern World Economy. Princeton: Princeton UP, 2000. Thornton, John. Africa and Africans in the Making of the Atlantic World. Cambridge: Cambridge UP, 1992. Tomich, Dale. Through the Prism of Slavery. New York: Rowman and Littlefield, 2003.